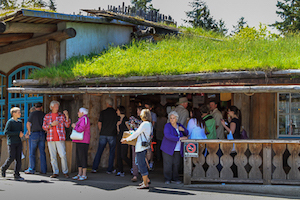 Everyone who visits Coombs on Vancouver Island, BC, Canada, just has to see the market with the famous pygmy goats on the grassy roof. 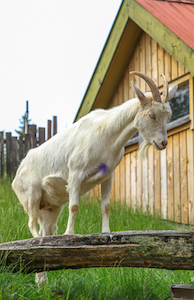 The goats (named Willie, Daniel, Nibbles, and Minion) are still there but other things are ever-changing. The manager, Arthur Uri, says the future of the market depends on its ability to change. Nowadays, the market has grown to comprise an international grocery known far and wide as the place to get almost anything that comes to mind. In addition to the usual fresh fruit and vegetables, locals say you can get art supplies, antiqued Chinese figurines and furniture, imported gifts from around the world, and sandals with a beer opener in the sole. In the market complex is a café-style restaurant, a European deli, and a scratch bakery with artisan breads. 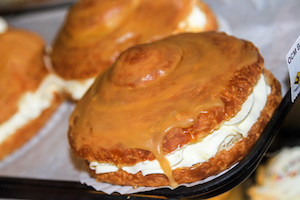 One of the most popular items in the bakery is a bee sting donut, which is a light pastry with homemade vanilla custard and a caramel topping — to die for and highly recommended. In 2016, the ice cream shop is expanding (it formerly had 55 choices of flavors). Other shops include a produce market, Zolena’s garden shop, and the Wabisabi surf shop run by Kris Graaten’s grandson Evan. But we are not finished yet. Up the hill from the market is a high-end Italian restaurant known as Cuckoo’s Trattoria and Pizzeria, with Chef Fausto Bellicini, located in the original home of Kris Graaten. A genuine Italian restaurant must have an Italian chef, right? 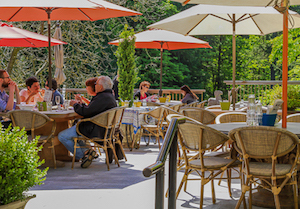 There is both indoor and outdoor seating, complete with fountains, flowers, and greenery for the enjoyment of summertime diners. Another change? A Mexican taqueria, cantina style, with a Mexican chef, now located in the main market restaurant area. The market is always a beehive of activity, with tourists and locals mingling outside on the street as well as inside, and all enjoying the festive atmosphere, along with ice cream and bee stings. Watch for traffic as you wander around as it is so easy to get distracted. No doubt there will be ever more changes, but the goats will remain.